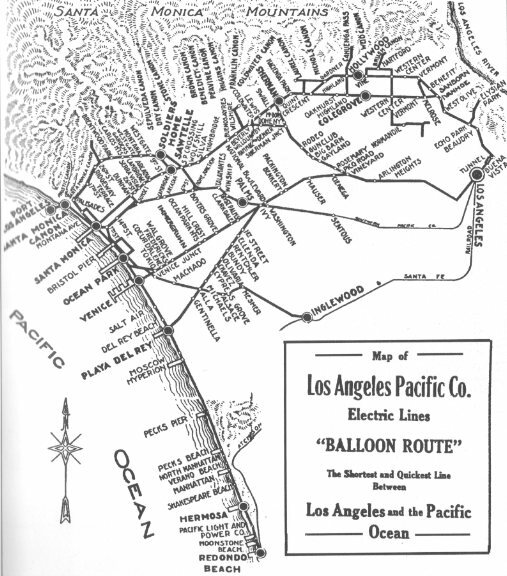 From 1988 to 1902, the Los Angeles Pacific (LAP) Railway Company (which later merged with the Pacific Electric in 1910), had developed an extensive interurban transportation system that serviced Los Angeles, Santa Monica, Venice, Inglewood, and all areas shown in the accompanying map. 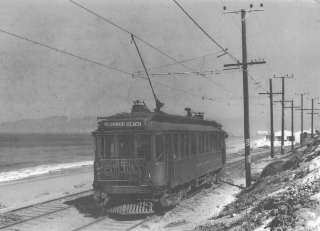 In 1903, the LAP extended the line south from Playa del Rey to Redondo Beach passing through Manhattan Beach. The double tracks were just west of The Strand where the bicycle path is today. First the LAP “Green Cars” and then the PE “Red Cars” would greatly assist in the transportation needs of the beach residents and weekend visitors from inland areas. 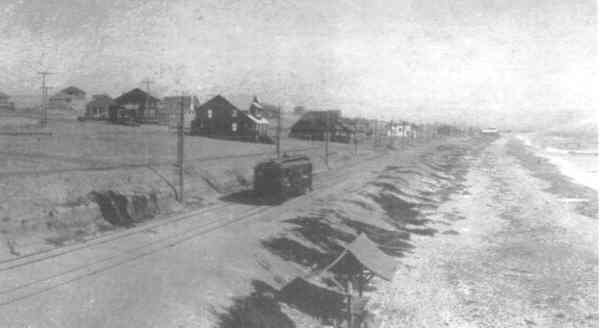 It is believed that the addition, in 1903, of the trolley is generally responsible for the real estate boom along the South Bay beaches. The PE Red Cars would continue to run on this line during the 1930s when competition from buses and private autos caused the line to become economically unviable. The line that ran along the beach was shut down in 1940. In those early days [when Mr. Allen was a boy, 1903-1910], the LAP [Los Angeles Pacific] Green Cars [these being before the affordable Ford Model-T and the streets were paved] were our only practicable connection with the outer world. Passenger-carrying was their main function but express cars came regularly with life’s necessities; one of my uncles was an executive [with] a brewery in San Francisco and well do I recall [a periodic meeting of] an express car [and] receiving a barrel of beer, and rolling the barrel up the hill to our home – telling old ladies that it contained soda pop! The [South Bay] line down the coast to Redondo Beach was originally narrow gauge. About 1907, LAP decided to standard gauge it. [The re-gauging process was very fast]. I remember riding on Saturday on a narrow gauge, [and by] the next Monday morning everybody was riding standard gauge cars. [With this upgrade came larger cars]. [The South Bay line] usually used the 200 car, except on the weekends and holidays when the big 700s were used – and then the press was so terrific that three-car trains were run on frequent schedules – and with commonplace standing loads! [On the weekends], we kids would frequently go to Redondo Beach [on the Green Cars] and we learned early how to ride [them for] free! [Coming back to the north,] the cars leaving Redondo were so crowded that the conductor would necessarily have to make his way through slowly. He started at the front end, so we rode the back platform. By the time we got close to home we would pretty well know if he would get to us or not. When it appeared that he would be upon us momentarily, we would drop off [at 1st Street or 5th Street, and sometimes all the way to 8th Street].